Ford CEO Alan Mulally, the man widely credited with avoiding bankruptcy and bailout at the nation's No.2 automaker, will stay in his job until "at least 2014," the company announced Thursday. Ford also named Mark Fields, the president of operations in North and South America, as its new chief operating officer -- and, according to analysts, the likely eventual successor to Mulally. Fields will take over much of the day-to-day decision making at the company while Mulally focuses on long-term strategic issues. The company also named a number of other executive promotions. Shares of Ford (F) rose more than 1% on the news in early trading before retreating on softer than forecast October car sales. "This is great news," said John Murphy, auto analyst with Bank of America Merrill Lynch, in a conference call with analysts. "We love Mark, but it's great you're staying," he told Mulally. Rumors have been swirling about pending retirement plans for Mulally, 67, and who his possible successor would be since late last year. But Ford and Mulally had refused to discuss plans publicly until now. 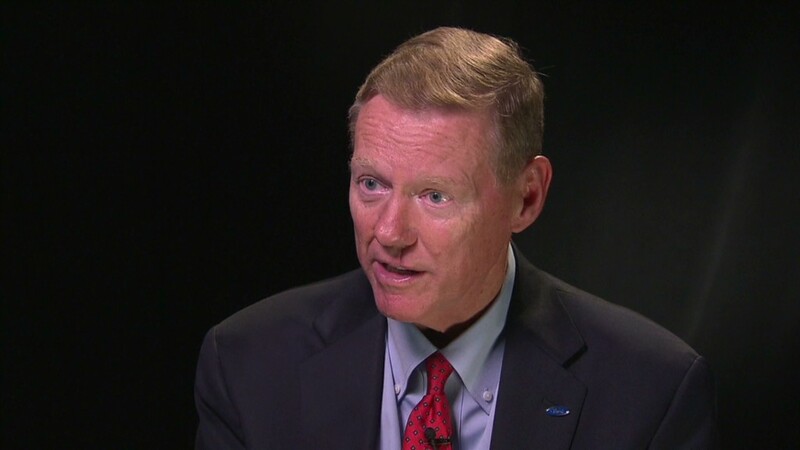 Mulally has been CEO since 2006, succeeding Bill Ford, the great-grandson of company founder Henry Ford. He was brought in from Boeing (BA), where he had headed its commercial aircraft unit, in an effort to shore up Ford, then widely seen as the weakest of the U.S. automakers. Under Mulally's guidance, Ford shed secondary brands such as Volvo, Mercury, Land Rover and Jaguar, and started designing and building cars on a more global basis to cut development costs. Perhaps most important, Mulally mortgaged most of Ford's plants and other assets -- including the rights to its iconic "Blue Oval" logo -- to provide it with the funds needed to pay for the transformation. When the U.S. economy fell off a cliff in 2008, causing auto sales to plunge and financial markets to freeze, rivals General Motors (GM) and Chrysler Group came close to running out of cash and had to turn to the federal government to finance their operations through bankruptcy. But Ford was able to avoid their fate. Related: Is Mark Fields ready to run Ford? Ford also had much better products to offer car buyers. After 13 consecutive years of declining U.S. market share that had seen it fall behind Toyota Motor (TM) for the No. 2 spot, Ford gained share in 2009 and each of the two subsequent years. Although its share is slightly lower so far in 2012, it remains anchored in the No. 2 spot that it retook from Toyota in 2010. The bottom line also improved greatly under Mulally. Ford earned its largest profit since 1998 last year, and this week reported much stronger-than-expected third-quarter earnings. Mulally said Fields also deserves much of the credit for those strong results, as his Americas unit posted a record quarterly profit in the third quarter that helped the company ride out rising losses in Europe. He also has run Ford operations in Europe and at Mazda when it held a controlling stake in that company. But the company still stopped short of definitively saying that Fields will be the next CEO. Despite questions from the press, Mulally was reluctant to identify his greatest accomplishment or legacy at Ford CEO. "What I feel very good about is we not only survived but created a company that is healthy and growing," he said. Bill Ford said it is too soon to talk about his star CEO's tenure as completed. "There will come a time for us to discuss Alan's legacy, but the good news is Alan is here for a long while," he said. 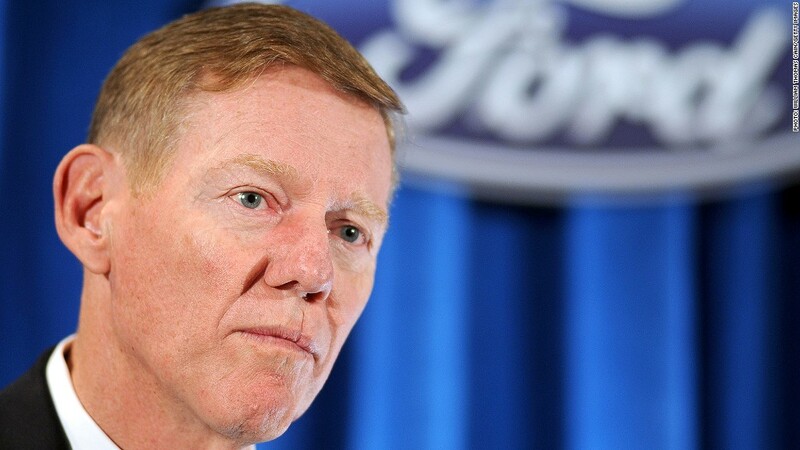 The chairman said he hopes Mulally will agree to stay on past 2014. "I'd like him to stay forever," he said. Mulally has become one of the best-paid auto executives, receiving a pay package worth $29.5 million last year, largely because of the more than 600% run-up in price of its stock since a low point in early 2009.